Enter your postcode for EE broadband deals in your area! 70 channels including 11 HD. 1TB EE TV box memory (pause, rewind, record, catch up and on demand). 83 Freeview channels including 13 HD. 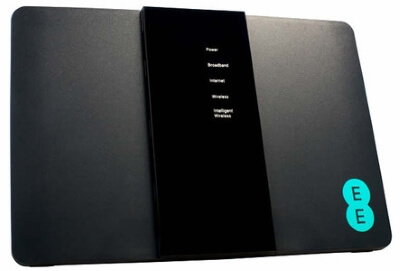 1 TB EE TV box (pause, rewind, record,catch up and on demand). EE was formed from a joint venture between Orange and T-Mobile to launch the UK’s first 4G network, and later branched out into fixed line home broadband. It’s now offering both ADSL and fibre home broadband and TV bundles to go alongside fast mobile broadband. EE home broadband replaced the long running Orange home broadband which was well loved by many for offering very cheap internet to mobile subscribers. Crucially, EE mobile customers continue to benefit from free extras when using EE at home. EE is a BT Openreach network reseller, so you’ll find its range of broadband products is the same as many other ISPs, with the choice of both ADSL and fibre optic connectivity. Your options will depend on availability in your area (see EE broadband availability below). EE broadband deals come bundled with a free EE broadband Wi-Fi router and free online security tools. All EE broadband deals include line rental with inclusive weekend calls to UK landlines - the price you see on our comparison tables for EE broadband packages is the cost of both the broadband and line rental. Anytime and mobile calling can be added to your bundle for an additional monthly fee. If you’d like to pick up a broadband and TV bundle, that’s available too. EE TV deals include a TV box with 1TB hard drive which offers live pause and rewind and recording features. You get access to Freeview broadcasts plus catch-up TV and optional pay services such as NOW TV. Multiscreen support is included, allowing you to view up to four different programmes using both the TV and mobile devices. EE operates the UK’s largest 4G network and regularly ranks as the fastest mobile internet provider. EE mobile customers who sign up for EE home broadband also benefit from a bonus of 5GB extra mobile data every month. As a reseller of BT Openreach services, EE home broadband is available to a majority of homes and businesses around the country. In order to receive their services you must be within range of an exchange, and the exchange must offer the type of broadband you want. Almost all exchanges now offer at least ADSL with an average speed around 10Mb, and more than 80% of properties have access to fibre optic broadband. To get started enter your postcode into the postcode search on our comparison tables in order to filter broadband deals by location. You can use the filters to the left of the table to narrow down your options, to view EE deals with no setup fee for example. Which is right for you? ADSL broadband is cheap and usually fast enough to cope with anything you might want to do online, however it’s not well suited to being shared among more than a couple of people at a time. It also has a very slow upload speed which could be a problem if you regularly transfer large files. Faster fibre optic broadband is far better suited to downloading and uploading large files, and can cope with many people sharing the connection. But you will pay slightly more for the privilege. Remember that broadband speeds can vary depending on your location and other factors. When joining EE you will be given an accurate speed estimate. To find out more about this topic, read our guide to broadband speeds. EE fibre broadband packages are all unlimited and do not use traffic management. Some ADSL connections are also unrestricted, however in some areas the exchange may be classed as “off net” (meaning EE did not previously have LLU equipment installed) and in those cases an EE ADSL broadband package will be restricted to 20GB usage and use traffic management. If you move from an “off net” ADSL service to an EE fibre package you may find that traffic management is still applied, and may need to contact EE customer services to have this fixed. With unlimited data and no traffic management on many of its packages, plus reasonably low prices, EE is a good value offering. And if you’re an EE mobile user you’ll benefit from an extra 5GB data each month. But not every service is unlimited - those outside the EE network (only a small percentage of homes nowadays) will find that ADSL packages are not as competitive as they will come with usage caps and traffic management. And regardless of what package you choose there’s only ever the option of a comparatively lengthy 18 month contract. 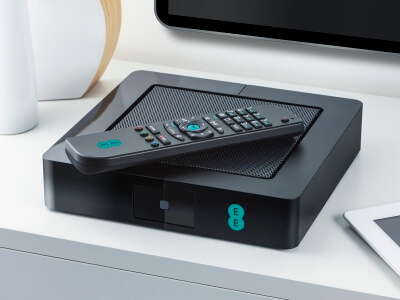 We like EE’s TV box for its handy multiroom and customisable guide features, but it’s a shame that unlike many of the other TV and broadband providers you don’t get any additional premium channels for the extra monthly fee.